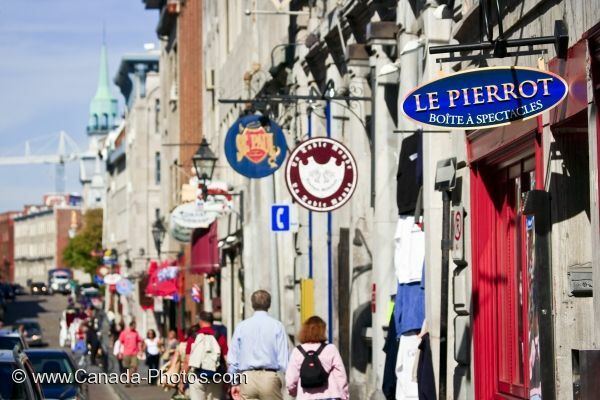 Signs are displayed all the way along the historic Rue Saint-Paul in Old Montreal, Quebec making this street easy for tourists to find their way around. Signs hang off the metal poles which protrude from the historic brick buildings, some not easy to read, while others making sense to every visitor, such as the telephone sign. The traffic is busy along the Rue Saint-Paul in Old city of Montreal as two major tourist attractions such as the Bonsecours Market and the Notre-Dame De-Bonsecours Chapel are located here. Both the cars and the people walking, make up the busy atmosphere of the street, especially during the summer months. Signs along Rue Saint-Paul in Old Montreal, Montreal, Quebec, Canada. Picture of the people wandering the historic Rue Saint-Paul in Old Montreal in Quebec, under the display of street signs.